Don’t take anything from the wild except a picture! Desert tortoises, which are a “threatened species” on the federal and state of California endangered lists, are most active in the springtime and fall when they forage for food and water. If you see a tortoise, leave him undisturbed and avoid picking him up – he can become startled and lose the water he has stored for survival. Desert tortoises may wander during these active times, but that does not mean they are lost. They are very knowledgeable about their environment, and can find their way back to their burrows, if they aren’t moved. The only time it is acceptable pick up and move desert tortoises is if they are in danger of being hit by a car. In this case, pick him up gently, keep him low to the ground, move him to safety, and set the tortoise down gently in the direction he was going. Just last week, the California Department of Fish and Wildlife advised, “If you care, leave them there” in regards to the Western Pond Turtle. During their lifetime, these turtles may leave the “pond” for a variety of reasons. Just because they are not in the water, does not mean they are sick or lost. CDFW recommends a “hands-off” approach. 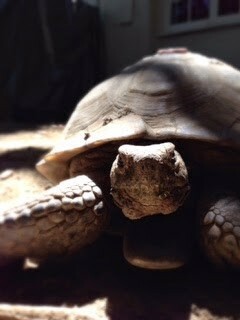 Unfortunately, turtles and tortoises can become sick and injured due to their biggest predator: man. Sick or recently injured turtles and tortoises should be carefully transported in a covered container to the nearest wildlife rehabilitation center as soon as possible.